We would like to thank you for making such an affordable, high quality trailer. We previously owned a Gulf Stream and a Wilderness. In the midwest, the brand names Excell and Hitchhiker are known for their quality and also their expensive price tag. We were delighted to find a trailer of even higher qulaity yet so affordable. Our first thought on seeing our trailer was how beautiful it was and is. I would like to list the things that we especially like about our new tailer. We are impressed by the high quality inside and out. We were impressed by the way it pulls. We like the floor plan we chose where you enter off of the carpet. I like the drawer under the stove and the cupboard above the stove with it's half shelf. We like the way the entertainment center is situated. They way you used the space for it was very well planned. We like the way that every closet can be used for storage or hanging clothes. We like where you have the furnace located. It heats up the entire trailer very well. In our other trailer we did not seem to be as warm as in this trailer. We also appreciate that you put white fender skirts on this trailer instead of the green. We think the white skirts look much better. We especially like the mirrored closet doors. They make the bedroom area so spacious. We like the fact that we can use all of the kitchen cupboards and the microwave while the slide-out is in. Everyone that looks at our new fifthwheel is very impressed. Here are some comments that we have heard. "This trailer is fantastic." "Awesome trailer." One womand said "This is designed so well. He was thinking like a woman when he designed the good use of space." One contractor looked it over and said "This is well constructed. I wish they made pull-behind trailers." He thought we got a real buy. He watched the video and asked my husband if our trailer was all we expected. My husband told him that it was much more than we had expected. We want you to know that we really appreciate your personal service. We felt free to call anytime with any questions. You always answered our calls in a prompt manner. We also appreciated your qualified suggestions such as installing fans. All of this was really helpful. We have never ordered anything like this in this manner, but you made it fun. When we came to pick up the fifthwheel, Mike and Cindy were very helpful in explaining things to us and helping us get the right equipment on our pickup. We were very pleased with our fifth-wheel and we feel it was well worth the trip to Indiana. We are so happy we saw your ad in the Good Sam Magazine. Thanks to you again for being so kind and making such a beautiful and affordable quality built fifth-wheel. P.S. We are now in Arizona. We have lived in our fifthwheel now for two weeks. Still are finding things we are pleased with. It is a nice home away from home." "Thought you might like to know what has been going on with one of your rigs. Barbara and I own a 2007 38-39. We, at present, are working as workampers at an RV park on the Oregon coast. Our rig sits more or less facing due west. So far this season, we have had a number of wind storms out of the south come ripping through here. Officially, the worst one so far this year was one about a week ago that was reported at 94mph. I do believe the one last night was worse. We did make the concession to the wind of pulling in the large slide on the south side during the first wind storm. Last night's was bad enough that we pulled in both the big slide on the south side, and the bedroom slide. Once those two slides were in the noise level went way down (no more topper slapping) so Barbara, our two pets, and I were able to sleep the night through. No leaks, no damage, no problems. Thank you for building a great coach. "Russ, just thought I'd drop you a line to let you know we are still living in our 2000 Americana 5th wheel and loving it. This is Annette and Ben Dean from California. 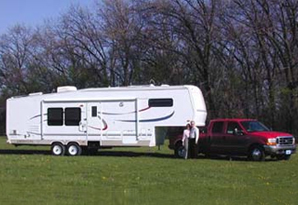 We met you in CA to see some of your trailers then picked up our trailer in Elkhart in the spring of 2000. We live in it full time. We have enjoyed it immensely. We still can't solve the bouncing problem of the back; so, we just move our glass dishes to another part of the trailer when we travel. Also, we love the bed you gave us. We have replaced an inner bag once or twice on one side or the other. Luckily, we happen to be near Carson City for the replacement bag. Other minor repairs happen from time to time, but that is wear. We don't travel much anymore. We are in an SKP park in Aguanga, CA and go to South Lake Tahoe in the summer where we are camp hosts. Eventually, we may look for a travel trailer with no steps to live in. Until then, this is home. Thanks again for a fine trailer. Happy Holidays to you and yours, Russ. "As they say - the check is in the mail! It is an investment account check. Would that be satisfactory in June or would we need a cashier's check? This shows me how "small" the US has become. A man from Maine orders a unit from a man from Montana with an office in California and the unit is to be picked up in Indiana! Also the participants have never met! Well it has now been just about one year since we picked up our RV in Elkart. Pat and I have driven it over 10,000 miles in the past year. We just wish to tell you that we are extremely satisfied with our GS 28/29. It has been a true pleasure taking it on our various trips. In all cases it has performed to expectations and has never presented us with any major inconvenience or problems. We just are "happy campers". It is a great comfort to feel secure and know we are going to have a great time when we go RVing. We thank you for providing a great product. Just for your own knowledge, we've been living in our rig now for a year and a half and we're constantly comparing notes with other full timers and when the total assessment is in, we feel we've got a pretty good 5th Wheel trailer and got a pretty good deal too. The options we chose as well as those made a part of the "Americana" series has also served us well. One of the main things you helped us with, is matching the trailer to our truck. It still pulls beautifully and we've had few towing problems (the only one really has been a tire blowing) and we feel that's primarily due to so much construction be done on the roads and a hazard finally caught up to us. We feel safe in respect to the weight we are pulling for the truck specifications and it's truly been an eye opener when meeting so many folks pulling much more weight than their tow vehicles are rated to pull. One guy had a 1 ton Dodge (99) pulling a triple axle "King of the Road" which had a GVWR of 21K, so he was already over by 1K without including the truck for a GCWR rating of 20K for that particular truck. Can you believe it? Anyway, it's been good and we thank you for your expertise in helping us choose the right rig for us. We are really enjoying our new mattress and feel it's definitely going to help us in the long run. Good nights of sleep have already been attained. We've loaned your video to other to view already. Write when you get the chance. I would have liked to have talked to you on the phone to tell you how happy we are with our Americana. You know the xxxxxxx's, they showed up early Wed. P.M. and Mike said our 5th Wheel was ready, so they pulled it out of the lot, and parked it and we went through it with Mike and then made plans to spend the night in it. I noticed that the pull outs were not in the kitchen, so Mike said he would have to e-mail you and make sure we were suppose to have them,(we forgot to take the contract with us). So we went to supper, came back, they had filled it with water, the furnace was on and it was nice and warm in the trailer. We spent some time reading part of the material Mike had given us, we played some cards, and decided it had been a long day and we were ready to retire for the night. Everything was going great, until I woke up about 2:30 a.m.(3:30 a.m.their time) and boy was it cold in the trailer. I woke Mel up and told him I didn't hear the furnace running, he got up turned on the light and it looked like a candle. I told him maybe someone had unplugged the electricity, so he went out and checked, it was OK. So he said we could at least go out to the truck and get warm. Which we did, then I said do you think the pipes might freeze, he said I don't know, so we decided we had better call Mike. We drove all over looking for a phone with a directory, couldn't find one, but found Dunkin Donuts open. I went in and got Mike's phone number and called him, he said I'll be there in 20 minutes. So we bought some donuts and chocolate milk, went back to the trailer and sat in the truck eating until Mike got there. He said maybe the plugged fell out in the shop and he went to look, came back and said a breaker had kicked out. Said it happens only once in a blue moon. It didn't take long for the trailer to get warm and boy were we sleeping sound. The next thing we knew someone was knocking on the door, it was Mike. Talked to him for a few minutes, then went to breakfast, came back went over a few more things, and they had put on the spare tire (which we decided to get). Then Mike had one of the guys show Mel how and what to do to hook up the trailer to the pickup. We also bought a few more things from Mike and then we were on our way home. Mel just found out the he has a herniated disk in his neck, so he will have to have surgery before we can take off traveling. He said he would drive the 5th Wheel until we got on the Interstate, then he wanted me to see if I could drive. Well he started out driving got through the toll booth, pulled over and said are you ready to drive???? I drove all the way home. He said he was proud of me, the only thing was that I made sure when we pulled in to the truck stops and etc. that I didn't have to back up, wasn't ready for that part yet. Russ I can't tell you how surprised I was at how easy the 5th Wheel pulled, at times I had to look in the mirrors to make sure it was still there. We even hit some wind but I still didn't have any problems. What a dream it is to drive. I had planned on e-mailing you the minute we got home, but we just got home (2:30 p.m. Friday) and found out the a real close friend (51 yrs. old) had passed away and the funeral was Sat. morning so of course I forgot all about letting everyone know we were home. Should have done this sooner, sorry. I guess I had better sign off for now. Happy Holidays to you and your family from the Kay & Mel Meier from NE. P.S. There was a couple form Michigan and a man from New Mexico there the same time we were. We got to talking with them and was surprised that we all had learned about the Americana from the Internet. Ruth and I Pulled out of our driveway up here in the mountains of Leavenworth, WA on March, 24th with inches of snow still covering the fields around our home. As we traveled toward Arizona we were in utter amazement of all the semi-trucks, that traveled I-5 in California. Literally hundreds of them passed us one way or another, and our 'new' 5th wheel "Americana" wavered not a bit. Climbing the "Grape Vine" in California was a joy--never under 35 MPH and our F350 1999 Ford Turbo diesel met the challenge we expected we averaged between 10 and 12 MPG the entire 3,000 plus miles. With 90 degree plus weather in Arizona the 1st part of April, our 5th wheel passed the test of efficiently cooling down with very little AC. Ruth drove a great distance in Oregon, even down the long Pendleton grade with total control of both trailer and truck! Are we happy with our 2000 GS 36/37 RL? All you have to do is see our smiles when we explain to our friends what we believe is the best 5th wheel trailer on the road!! Thank you, Russ for helping us feel like true "Kings of the Road". We have been looking to move from a pop up to a fifth wheeler in about 18 months or so. We have been getting so much info from so many sources that are heads are swimming in it. We have been impressed w/ the Americana but do have some worries about service & a few other things. Hope you dont mind answering some questions. What do you own,LC or GS?, How long have you had it?, What size?, What do you like & or dislike?, What would you do differently?, What do you tow it with?, Would you go bigger w/ your tow vehicle?, what kind of milage?I guess Ive bothered you with enough questions. I have been tent trailering for about the last 29 years,hope to retire in a couple so we thought we would move up & see some more of this beautiful country. Thanks for your help! Sorry we've taken so long to reply to your note. We haven't been checking our E-mail lately. Too much Spring work! We're very happy to share our limited experiences with our new 5th-wheel. We are so excited and pleased with it. We picked it up in Elkhart over the Easter break, since I teach and have that week off. We couldn't have been more pleased and satisfied with the attention to detail and instruction given by Russ. He spent almost the whole day with us, instructing us in every aspect of the RV. He even had John practice driving and backing up. We purchased the GS 33-34 RK Model, in shades of blue. You asked for likes and dislikes. We really have no dislikes, hard as that may seem to believe. We were totally satisfied with our RV when we first saw it. Everything was exactly as we ordered it, and more. We've only used it twice, on the way home from Elkhart to NC so we don't have a lot of experience in towing, etc. However, John had absolutely no problems towing it over the mountains of WV and NC. We pull it with a new Ford 350 dually, diesel. We bought it specifically to pull the RV. We can't think of a thing that we would do differently with the RV or the dealership. If we ever need service, we will go to a local RV repair place, or a place called Camping World. We spent about two years looking at RV's, both on lots and online. We went to many camper shows and did a lot of comparing. We can honestly say that we have more RV for the money than we could have gotten anywhere else. John was very nervous about handling this deal online, but it turned out great. We drove out to look at the RV last July and spent the whole day with Russ while he explained EVERY LITTLE DETAIL of his units. He's very thorough and very proud of his products, as well he should be. Every detail in the RV is top of the line, quality workmanship. We've had campers all of our married life, 33 years---everything from tent trailers to our last unit, a TEENY 16 foot travel trailer. We bought the present unit with our retirement in mind. We plan to do some Workamping, which is working and living in national parks for the tourist season. We also plan on doing a lot more traveling. We love it. Please write back and let us know if we can help. We'll be anxious to know what ya'll decide. Thanks for your candid message/reply, it is reassuring to know that in this day & age there are people/ dealers/manufacturers that really have the consumer in mind ; thats is to sell quality. We are still trying to figure the total cost of buying both an rv and tow vehicle. Thanks for your input, & many happy advenures & miles of campinf w/ your new rig. Again Thanks! 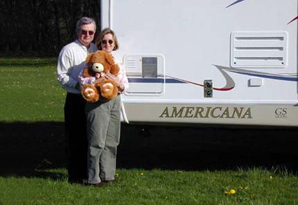 John and Lana with their new Americana Model Fifth Wheel. John and Lana with their new Americana Teddy Bear.